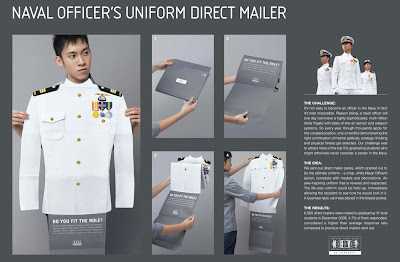 directdaily: Republic of Singapore Navy "Uniform"
It's not easy to become an officer in the Navy. In fact it's near impossible. Reason being, a naval officer will one day command a highly sophisticated, multi-million dollar frigate with state-of-the-art sensor and weapon systems. So every year, though thousands apply for this coveted position, only a handful demonstrating the right combination of mental aptitude, strategic thinking and physical fitness get selected. Their challenge Naval Officer's jacket, complete with medals and decorations. An awe-inspiring uniform that is revered and respected. The life-size uniform could be held up, immediately allowing the recipient to see how he would look in it. A business reply card was placed in the breast pocket. 6.000 direct mailers were mailed to graduating "A" level students in December 2008. 4,7% of them responded, considered a higher than average response rate compared to previous direct mailers sent out. Agency: Saatchi & Saatchi Singapore.